Three of the most vulnerable five open Republican seats can reasonably be considered as leaning to the Democrats: FL-27 (Rep. Ileana Ros-Lehtinen), CA-39 (Rep. Ed Royce), and NJ-2 (Rep. Frank LoBiondo). For some time, FL-27 has been viewed as the seat most likely to move into the Democratic column. But recent developments suggest that the Republicans are not ready to concede the seat quite yet. Both parties have eight announced candidates, with the stronger ones appearing in the Democratic primary. Just recently, however, a new Republican came onto the scene who gives the GOP hope that she can wage a strong battle. Angie Chirinos is a songwriter and fundraiser for the Voices for Children Foundation. She is the daughter of Willy Chirinos, the Grammy Award winning singer/musician who escaped the Castro regime in 1960. California Rep. Royce’s retirement appears to yield Democrats the inside track now that the seat is open, but already at least three strong Republicans have come forward who can quickly bring the district back into the toss-up realm. Former state Senate Minority Leader Bob Huff, Orange County Supervisor and former Fullerton mayor Shawn Nelson, and ex-assemblywoman Young Kim all will be formidable candidates, each with a stronger electoral record than any of the Democrats currently running. Rep. LoBiondo’s southern New Jersey seat has been safe for him and the GOP since his original election in 1994, but won’t be so as an open seat. 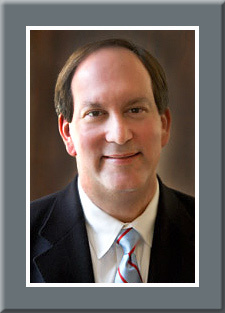 With the GOP having yet to announce a viable candidate, state Sen. Jeff Van Drew (D-Cape May) is the clear favorite to convert this seat in November. 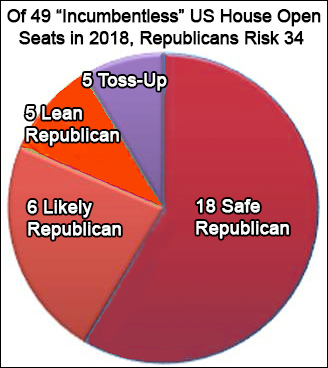 The open R seats falling into the toss-up category are AZ-2 (Rep. Martha McSally) and CA-49 (Rep. Darrell Issa). Rep. McSally’s Tucson seat has consistently played as a pure toss-up since former Rep. Gabrielle Giffords (D-Tucson) was forced to resign. While the media is painting the Issa southern California district as almost a sure bet for the Democrats, it is not, and arguably, the Republicans could be in better shape here with a fresh candidate instead of an incumbent whose negatives have been steadily growing. Rep. Carol Shea-Porter’s NH-1 district has only re-elected one incumbent since 2006, and has become the nation’s quintessential swing district. This seat could go either way in any election year. Rep. Tim Walz’s southern Minnesota electorate only returned him to Washington with 50.3 percent of the vote last year, while providing President Trump with a 53-38 percent victory margin. Southern Nevada’s 3rd District has been in existence only since the 2002 election but has elected a Republican in six of its eight congressional elections. Freshman incumbent Jacky Rosen (D-Henderson) is running for the Senate, but only scored a one-point, 47-46 percent, victory here in her US House race in 2016. The two in the Lean D category are AZ-9 (Rep. Kyrsten Sinema) and NV-4 (Rep. Ruben Kihuen). Though decided underdogs, Republicans have a strong candidate in Arizona physician Steve Ferrara, who had already raised more than $400,000 by the end of September. He will likely face Phoenix Mayor Greg Stanton (D) in November. Rumors persist that former Rep. Cresent Hardy (R-Mesquite) will soon announce that he will attempt a political comeback in the northern Las Vegas/central Nevada seat now that incumbent Rep. Kihuen won’t seek re-election because of a sexual harassment accusation. The open seats will become a focal point in the coming House elections, but the actual numbers and voting histories yield a much smaller number of highly competitive districts than current analytical perspectives are suggesting.